Do you or someone you know rely on sign language to communicate and you're looking to improve your knowledge/skills? 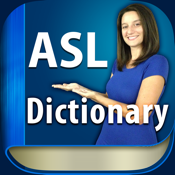 The ASL Dictionary HD American Sign Language app for your iPod touch, iPad, and iPhone acts as a handy reference and educational tool to provide you with all the information you need. This app comes in really handy since it offers more than 5,000 words translated into American Sign Language via video. This is a user-friendly approach that will work for those new to ASL and those who have been using it for years. The ASL Dictionary HD American Sign Language app isn’t just a dictionary; it’s an interactive dictionary that translates words into the videos so you won’t be left confused about the sign. There are more than 5,000 words in this dictionary that are seamlessly translated by video. What's great is that when you watch the video translation you can even slow it down so you are sure to get it right. This is meant to be a complete dictionary with translations for the alphabet, numbers, money, time, dates, and more. Because it is so complete you may find this is the only reference tool you need. And what's really handy is that you don't need an Internet connection to use it. The app was updated over the summer with some minor enhancements and it requires iOS 7 or later to use. Users have given it a perfect five star rating and have provided all kinds of complimentary comments. The user experience with the ASL Dictionary HD American Sign Language app is very smooth and no-nonsense. While it doesn’t have the slick and modern look of some that really doesn’t matter because this one is all about the content instead. There are a number of helpful features built into the app such as being able to play all the videos, putting together your own favorites list, and even quizzing a particular category or your favorites list. You can replay videos, put the video on a loop so you can keep watching until you get it, perform a search, view the videos by category, and just swipe the screen to advance to the next video. It should be noted that none of the videos have sound as these are strictly for signing purposes. Another great feature is the fact you can view the video in full screen so you can see the details that much easier. The ASL Dictionary HD American Sign Language app for your iPod touch, iPad, and iPhone is a user-friendly way to familiar yourself with sign language through high-quality videos.